You'll be hearing more about this hitherto unknown Swedish thriller: Yellow Bird, who made the three Millenium movies (Girl With The Dragon Tattoo, etc), are apparently going to film it. Remember you read it here first.But back to the book. It's harder than I expected to review Nobels Testamente, #6 in the Annika Bengtzon series, because it's really three books in one. The surface story is a fairly conventional thriller set in the world of Swedish biotech research. The chairwoman of the Nobel Prize committee has been spectacularly murdered while she's dancing at the Nobel Dinner; Annika, as usual, just happens to be a couple of metres away, and becomes involved in the case. This part of the story is fun, but I had a hard time suspending disbelief. I have worked at several research institutes and visited many more, and to say that Marklund is exaggerating doesn't begin to cover it. But if you're not another researcher, you may be happy to buy her version of the research world.The second thread is about Alfred Nobel's life. I didn't know that much about Nobel, and found it very interesting. Some bits of it seemed so unlikely that I was sure she had to be making them up: in fact, I quickly found out that it was all true. I don't want to give any of this away, since it's important to the plot, but I assure you that you'll be startled as well. There's considerably more to this guy than inventing dynamite and establishing the Nobel Prize.So... the thriller and the history were OK, but, as usual in the Annika Bengtzon books, the thing that really grabs you is her descriptions of everyday life, in particular the heartbreak of being a working mother. The only author I can think of who is better at voicing women's frustration and anger is Fay Weldon, and Marklund runs her close. Let me tell you the sequence I liked best.Annika's come into some money, and has just moved from Kungsholmen, a friendly but moderately downmarket part of Stockholm, to Djursholm, an expensive suburb. She feels out of place and the kids are having problems at their playgroup. It becomes clear that Kalle, her six year old, is being bullied by the bigger kids in his class. Her marriage is also in trouble. She knows that Thomas was seeing someone else, but he doesn't know that she's found out. Neither of them will admit what's going on and they're barely talking to each other. Thomas starts working longer and longer days, concentrating on his new career at the Justice Department. He feels he's headed for great things.Everything explodes the day that Thomas is due to make his key presentation to the Minister and his associates. He's been preparing it for over a year, and is in agony of anticipation when the phone rings. It's the playgroup. Kalle has fallen from the climbing-frame and hit his head. They think it's a concussion. How soon can Thomas get there?Thomas tells them to call Annika, who's supposed to be free that day, but her mobile is switched off. The woman at the playgroup is starting to sound seriously angry. He doesn't know what to do. In the end, he runs through his presentation as quickly as he can, then hightails it back to Djursholm. To make things even more complicated, he's invited his boss and some other important people to dinner that evening. Annika, who's been out sleuthing, suddenly remembers her mobile is off. She turns it on again, and gets eight increasingly frantic messages. She's overcome with shame and guilt. For a moment, it crosses her mind that this is insane, surely she ought to be able to leave her mobile switched off for four hours without the sky falling? But, in fact, that exactly how things are if you're a working mother in the early 21st century. She left her mobile off, and the sky is about to fall. She makes it home, and finds a tearful Kalle and a stony-faced Thomas. Annika's heart is bursting. The only good bit of news is that the hospital ran a PET scan, and Kalle definitely doesn't have a cerebral hemorrhage. They'd thought for a few minutes that maybe he did.She spends the rest of the afternoon fussing over Kalle and feeling terrible. Dinner, which has originally been intended as an elaborate gourmet experience, is drastically curtailed. Thomas is unimpressed with her food. Towards the end of the evening, there's an unpleasant scene with their neighbor, who's been consistently harassing them since they moved in. Thomas feels Annika has let him down there too.Next afternoon, when she goes to pick up Kalle from school, she has a word with his teacher. She assumes that Lotta has had a serious talk with the bullies' parents? The teacher looks uncomfortable. They took the line that boys will be boys, she says. It was difficult to get them to understand that this was not a trivial incident.Without quite knowing how she got there, Annika is truly desperate. Things are difficult at work. Her busband doesn't love her any more. The kids at school could have fatally injured her son, and might try it again. She feels she has nothing to lose. The following morning, she takes Kalle to school again. She can see the two boys who regularly pick on him playing in the sandbox. She goes over to the bigger one and put her face really close to his. "Benjamin," she says quietly, "you're never, ever to hurt Kalle again. If you do, I'm going to come to your house when you're asleep, and I'm going to kill you. "She knows it's completely wrong, that an adult should not say such a terrible thing to a small child, that there will certainly be consequences, but she does it anyway. And there are terrible consequences, more terrible in fact even than Annika has been expecting._____________________________________________For everyone else who's in post-Millennium withdrawal, help is approaching. The better Liza Marklunds are an acceptable substitute, and according to several Swedish sources they will start filming this one at the beginning of 2011. Annika is being played by Malin Crépin:A moment's search on GIS will turn up several rather hotter pictures, if that's what you're after._____________________________________________It's been released! The Swedish premiere was yesterday. You can see a trailer here. Waiting for these books to be translated is sheer torture, it almost makes me want to give a try at learning Swedish.All the excitement of the cutthroat world of modern scientific research. I know that statement sounds silly, but Liza Marklund through her investigative journalist Annika Bengtzon brings the tension of the world alive. When you are talking millions of dollars of research grants floating around, you are going to bring out the worst in a lot of people. The mystery was solid, Nobel prize committee member is assassinated during the after party of the awards ceremony. Who did it and why? Annika, who was literally dancing next to the victim, was the best eyewitness. Immediately she receives a gag order from the police, but that doesn’t stop her from digging into the case. I do not think most people realize how much money is floating around the research world if your work is successful, and more importantly, first. Put any random group of people in a situation wherein being first is the difference between wealth and poverty, you are going to see some dirty tricks. Watch any reality show like Survivor and you will see the same behavior. Having a PhD. will not make you play any nicer at all. It makes you all the more nasty because you at least understand exactly what is at stake. Liza Marklund has given us another solid Nordic Noir series featuring a compelling heroine. Waiting for these books to be translated is sheer torture, it almost makes me want to give a try at learning Swedish. This is another exciting installment in Liza Marklund’s series featuring crime reporter Annika Bengtzon. In this sixth book, we find Annika attending the Nobel Prizewinners’ dinner in Stockholm, covering this glamorous and prestigious event for the tabloid Evening Post newspaper. Then, as Annika is dancing with journalist Bosse from the rival evening newspaper to the one she works for, shots are fired on the dance floor. Finding herself caught up in the chaos that ensues, Annika is questioned as a witness, and is desperate to get back to the newsroom and tell her story, but this isn’t as straightforward as she or the paper would hope. Further murders occur, and Annika starts to trace the links between the crimes, but remains in a difficult situation as a reporter who is also a key witness to events. The author brings in a host of modern day concerns including terrorist and security threats and the treatment of those accused, the workings of scientists, researchers and drug companies, and the challenges and demands facing the newspaper in it’s attempts to be current and relevant in the age of the Internet with it’s offering of immediate online news coverage. Annika is as doggedly determined as ever to find out the truth; why was the victim at the Nobel Prizewinners’ dinner targeted and killed? What secrets are hidden at the medical institute at the university? Who is the cold-hearted killer at work here? There is a fascinating series of short narratives interspersed amongst the main storyline, which detail aspects of the life of Alfred Nobel himself, and which cleverly link in and add to the main plot.There are troubles for Annika at home, too, despite hoping to land her supposed dream family home in the countryside, the relationship between Annika and husband Thomas is decidedly rocky, and the pleasant new neighbourhood doesn’t seem to be as perfect and friendly as it might have first appeared. Once again she is trying to balance motherhood and her career, though a fortuitous event means that she has more money than before at her disposal. But danger is never far away for Annika and the more corruption and lies she uncovers as she edges closer to the truth, the more she must fight to keep herself and those she loves the most safe from harm as the novel builds to a dramatic and nail-biting conclusion. I love this series, and I really enjoyed this latest installment, another addictive page-turner that I read quickly. I like the short chapters that jump about so that at one moment we hear about Annika’s family life, then about the situation in the newspaper offices, then about what the killer or suspect is up to; this keeps the novel very engaging, fresh and pacy to read. I was perhaps not quite as fond of this one as I was of both The Bomber and Vanished, but Last Will is certainly still an entertaining, fast-paced and welcome addition to the Annika Bengtzon series, well translated again by Neil Smith, and I am already looking forward to the arrival of the next book. LAST WILLLiza MarklundLiza Marklund was one of the first Swedish authors, after Mankell Henning, that I read. She immediately became a favorite, but was very difficult to find. Now she is a #1 NY Times bestselling author and is printed in the US by Emily Bestler, one of the Simon & Schuster group.Annika Bengtzon is the headstrong and independent reporter. She has been through difficult times in her past and feels she has a tenuous hold on her present. The printed newspaper she works for, has laid her life on the line for, gives her a sense of identity, is giving way to new media forms, which gives her a sense of instability, along with her boss and co-workers. Her husband had an affair and she cannot forgive him. She has moved into a large house in an upscale suburb, with a hostile neighbor and her son being bullied at his new school. Normal everyday life. Annika must have her investigative reporting to hold herself together.One of the interesting aspects of this book is the plot woven around the Nobel Peace Prize and Alfred Nobel, the Swedish man who devised the plan for the prize. To set the stage for the plot, Marklund opens the book at the dinner for the Nobel winners and the important people who are invited to the dinner dance after the presentation. Representing her paper, Annika is having a dance with a reporter from the competition, when a woman is shot. The woman looks into Annika’s eyes as she crumples to the floor, dead. Chaos is immediate at on the dance floor, but the story skips to follow the murderer out of the building and through her escape, without telling us who she is or why she killed the woman at the Nobel Prize dinner. The police arrive and put Annika on a disclosure ban so she cannot report on what happened. The boss who is trying to get rid of her, puts her on indefinite leave of absence. Annika continues to investigate, because she just can’t stop herself.The Annika Bengtzon books are raw and violent, with non-stop tension. For your own enjoyment, read the books in order – it is worth looking for them. Annika is not always likable, nor are the other characters, but they are real. She is strong, yet feels utterly helpless when her son is bullied. She loves her husband, but is hurt and angry over his betrayal and allows her anger to drive him away. She is straightforward and outspoken, and on the side of the weak, and has no patience for bigotry or snobbery. Last Will is an interesting read for the information of the Nobel Prize, but the characters are the strong part of this series. You’ll be hooked. I read the fourth Bengtzon book, The Bomber, a few months ago & found it utterly gripping, I really liked Annika and looked forward to reading more of her exploits. Last Will was the only other Marklund book my library had, so I picked it up despite it being the 6th in the series. I average about 15 books per month and in my life I have stopped reading approximately 10 books midway through. This was the 11th. From the outset, I found Annika's attitude irritating and her existential crisis regarding her job, her marriage, and her place in the world to be annoying and unsympathetic. The crime at the heart of the novel held very little interest for me and I got bogged down in the medical and science terminology. I understand that I might have been more in tune with Annika had I read the book that came between The Bomber and this one, but I still find it hard to fathom a way that I could ever have been excited about the story as presented here. Around page 200 I realized that I was struggling to get through each page, that I was never inclined to pick book up once I'd put it down, and that if I closed it now and walked away, I'd never be curious to find out what happened. So I did just that. I may go back and get the first book in the series and see if that one is closer to the enjoyment level of The Bomber, then go from there. But Last Will gets two paws way down. Investigative reporter Annika Bengtzon is attending the ball that followed the Nobel Prize award ceremony.She becomes a witness to the murder of Christine von Behring who was the chair of the committee to select the prize for medicine.As a witness who came eye to eye with the killer, Annika can't wait to get back to the newspaper to write her story. However, as the sole witness, police place her on a disclosure ban. She's prohibited from reporting what might have been the story of a life time in case she reveal something vital to solving the murder.Frustrated at not being able to do her job and dealing with a husband who doesn't seem to appreciate her, she continues to look into the killing. She speaks to other people involved in the Nobel committee and finds that everything isn't as it should. She also becomes a target for the killer.Markland has a talent for writing suspense and for prose as we read the character's words and get a clear picture of events. I enjoyed reading this book and its well developed plot. Intrepid journalist Annika Bengtzon is back in the latest crime thriller by Swedish author Liza Marklund set in and around the world of medical academia and Nobel Prize selection. Annika not only finds herself witness to a shooting at the Nobel Prizewinner’s dinner but finds herself professionally ostracized from her job at the Evening Post unable to report on the events she has witnessed and placed on enforced leave. Needless to say Annika persists with her enquiries and as the body count rises finds herself embroiled in a plot amongst the higher echelons of the world of medical academia that leads to threats against her own life and that of her family. With an incredibly multi-stranded story line I thoroughly enjoyed the depth of research that Marklund brings to this book in the realm of medical science and the intense rivalries and secrecy that exist amongst this group of elite scientific professionals and gratifying that there was such a good representation of women amongst this elite group. Throughout the course of the novel much is learnt about scientific investigations into diseases that continually defy cure such as MS, dementia and so on and Marklund effortlessly weaves what could be quite dense scientific jargon into easily understood and fascinating detail. She also sheds light on the whole convoluted process of selection for the accolade of the Nobel Prize and there is an incredibly interesting subplot centred around the life and scandals of Alfred Nobel’s life that is central to the main plot and the motivations of both victims and murderer. Likewise we have a greater depth of characterisation of Annika who once again is juggling the demands of family and career but who is encountering extra personal stress carrying the knowledge of her husband’s infidelity, the problems that her young son is encountering at the hands of bullies and their move out of the city next door to a frankly deranged neighbour.There is also an intriguing ‘will she won’t she’ situation with the temptation of the gorgeous reporter Bosse who drifts in and out of the plot tempting our erstwhile heroine. Annika has much to deal with… Marklund once again proves her credentials amongst the Scandinavian crime posse presenting the reader with not only a perfectly researched and gripping plot line where much can be learnt about a subject not normally addressed in the crime genre, but fuelling the plot with her wonderfully observed characters intermingling the constraints and challenges for Annika in balancing the demands of her job with her emotional life and the danger that this places her in. An excellent read. Another enjoyable episode in this series of books featuring Annika Bengtzon. The cracks are appearing in her relationship with Thomas, for all that they have just moved to their dream house in the suburbs. Dreams are not all that they seem, and life back in the city is beginning to look more attractive again. Kalle is being bullied at pre-school,and severe cuts are being made in her work force at the paper. Meanwhile her accidental involvement as a witness to the murder of a scientist at the Nobel Prize celebrations and a consequent non-disclosure order being imposed upon her by the police result in Annika being sent on gardening leave. Being Annika, she cannot find satisfaction in unpacking and settling into their new home, and she manages to begin investigating the murder and gets deeper into the workings of the Karolinska Institute, which hosts the Nobel Prize programme. It is a fine story with plenty of suspense and tension, and a very dramatic and life-changing climax for Annika. Who and how decides that a novel is a thriller? I picked up this book thinking it was but looking at it now that I've finished it, can't see the word anywhere. On the cover, however, it does say, "Twists and turns you never see coming".Well, the twists and turns there may have been but they left me cold. At first I thought that it was all to do with the female assassin and it was right not to feel anything for her but later, when the female investigative journalist Annika Bengtzon became the centre, I didn't care about her either. She had neighbour problems and house problems and work problems and marital problems, but they didn't interest me. Even her relationship with her children - a key aspect in the life in any investigator - seemed just sugary and predictable. I was really diappointed in this book. Not only does the storyline disappoint but also the writing. In a translation of course one never knows whether to blame the translator or the author. And I learnt far less than I expected about the Nobel Pize to which the title refers. Last Will is by far my most enjoyable read *and I've read them in order once I realized they were a series) of Liza Marklund's novels to date. Annika Bengtzon, a reporter for the Evening Post, is attending a Nobel Prize Award Ceremony banquet in the hopes of finding a story worthy of a front page headline. A female assassin known only as “The Kitten” has been hired to kill Caroline von Behring, a member of the Nobel Prize committee at the Nobel Prize Award Ceremony banquet. The Kitten ends her target’s life but comes face-to-face with Annika. The Kitten and Annika make eye contact, Annika recalling she had yellow eyes.A gag order won't allow Annika to share her story. A depressing novel chocked full of gory details including animal torture. I wouldn't have finished the book if the torture had begun earlier in the story. By the time it came in, about 3/4 of the way through, I wanted to see who dunnit so I kept reading, but won't read another of this author's books. Not a book for animal lovers. En mycket välskriven kriminalroman och en av Liza Marklunds bästa. I "Nobels testamente" får vi en gång till träffa Annika Bengtzon, Kvällspressens journalist som utmanar både rättsväsendet och samhället med sina utredningar. Den här gången blir hon vittne till ett mord på Nobelmiddagen. Vi får också följa med i hur hennes privatliv utvecklas. Kriminalhistorian i sig är ganska originell - ovanliga motiv och en ovanlig mördarfigur. Det enda som är lite besvikande är slutet - enligt min åsikt är det något abrupt, vilket i och för sig också kan vara en fördel, men det kändes inte så i just det här fallet. Därför skulle betyget egentligen ha varit 4,5 i stället för 5.Bokens andra starka sida, förutom själva kriminalfallet och Annika Bengtzons utredande av det, är de viktiga frågorna den diskuterar - om terrorism (som blir mer och mer utbredd i dagens samhälle) och hur hotet hanteras av staten (det gäller egentligen alla länder, inte bara Sverige), om de mänskliga rättigheterna i vårt nya terrorhotade samhälle, samt en del allmänmänskliga frågor som relationer och barns uppfostran. Proffsmördare och psykopater och laboratorier och Nobelpriset och så Annika och hennes verklighet mitt i allt. Underbart!! Part of the Annika Bengtzon series. Have not read the series in order, but it stood well on its own. Good story, believable plot and moves along quite well. Intend to read the remainder of her novels, but availability through the library system is an issue. This is the 6th book of a Scandinavian Crime Fiction series.I never read the others but enjoyed the snippet of this that I read in a book sampler. I don't know how well the novels were translated but I'm able to understand everything and nothing about the flow of the story seems off. I enjoy that.A lot of this review is made up of my thoughts as I read through: What I don't understand is how the Annika Bengtzon novels have become so popular. She is self-centered and not a good wife. She also seems too frustrated by her children and yet how she responds to them is spectacular. She TALKS to them. There is no baby talk, but reasoning. I think her son Kalle has an issue that people are unaware of because he seems too violent in his words and actions for a 5-year-old. And when Annika explains her thoughts, the kids don't get their ways. The original deal stays on the table and can only be modified if the child continues to act out and then they are not rewarded. I freaking love it.But her husband cheated on her and she "dealt with that" (I'm nervous to know how) and stayed with him. So if she stayed with him, she better work out her issues and not want to cheat on him because that was her decision.Annika is a reporter who finds herself to be the sole witness in a homicide at the Nobel Prize ceremony and can't write about what she saw. Instead of wanting to talk to the police, she nearly threw a tantrum over the fact that her deadline was coming up and she couldn't write her story. Annika is put on paid leave, which helps as she and her family move to a larger area. Her husband has a new job that keeps him out of the house doing who-knows-what, and Annika grows antsy as information remains scarce. Her friend, Anne Snapphane, is a bit of a shady character. She raises red flags for me and almost a friend gold-digger. Annika's new neighbor Ebba Romanova is a scientist who worked with one of the Nobel victims and knows her history. She is maybe my favourite character.Annika & Thomas' other neighbor is Willhelm Hopkins, a jerk of the largest kind. He's the kind of man who is about the land - HIS land - and can't accept when land that was in his family for years has been sold. So he torments whomever lives in the house that the Bengtzon's bought. I want him punched in the face.It's sometimes difficult to see what is in front of our own eyes. Yet I feel very sad for Kalle when he obviously doesn't want to go to school and his behaviour changes. Poor kid.Mph, people fawning over Bernhard Thorell made me suspicious of him too.Not feeling for the characters made the reading slow at times. The ending threw me off a bit. This novel, the 6th by this author but only the second published in the US [in addition to one co-written with James Patterson], features Annika Bengtzon, reporter for the Evening Post, one of the main evening papers in Stockholm. The tale opens on a wintry evening in December, as the Nobel Prize festivities are about to begin. In the banquet hall, things suddenly take a shocking turn as shots ring out. One of the first victims is the Israeli co-recipient of the Nobel Prize in medicine, the second a woman who is a member of the Nobel Prize Committee. Three others are also wounded as the shooter, a woman, makes her escape. Who was the main target, and who the collateral damage? If the man, does anti-Semitism come into it, or is it the fact that the work for which he was being honored dealt with controversial stem cell research? If the woman, what could possibly have been the motive? Annika is more than just ‘present at the scene:’ Not only did the female victim look directly at her as she lay dying on the floor, quite near to Annika, but the woman who shot them made eye contact with her seconds before the shots were fired. As such, she is the key witness for the police, who place a gag order on her immediately. So she has exclusive information, which she cannot use, in the aftermath of which she is placed on six-month suspension from the newspaper, as well as in the sights of the killer, apparently an American assassin known as “the Kitten.”The title refers to the document prepared by/for Alfred Nobel, bits and pieces of whose life are interspersed, referencing his legacy, both as he saw it and as it has perhaps been perverted. Annika, married and with two small children, has been somewhat ambivalent about her impending move to a country home, as well as going through rough patches in her marriage. Now she is forced to spend more time at home, with the resulting increased tension there. This is made worse by the fact that her husband, a government employee, is actively working on legislation aimed at, in Annika’s view, at least, “restricting people’s private space with surveillance and more legislation,” a subject apparently dear to the heart of this author [as it is to many others, obviously, now more than ever].This is an exciting, well-written tale, with intriguing characters, and it is recommended. Last Will By Liza MarklundLast Will begins with a spectacular scene as the reader follows the assassin dramatically murder the chairwoman of the Nobel Prize committee, while she's dancing at the Nobel Dinner. This scene is followed by the thrilling escape of the assassin. Annika Bengtzon, a journalist covering the gala happens to be a couple of meters away from the crime and becomes involved in the case. Anxious to get back to her office and write this exclusive story, Annika is told by the police that because she is the sole witness they have her on a disclosure ban.As expected she complies with the public writing ban, but not her own private notes on the incident. In addition, she starts her own investigation of the victim and the Alfred Nobel committee responsible for the nominations and award of the prizes. The inserts of Alfred Nobel’s life history and some of the scandals associated with his life are interesting and follows the main plot. Because Caroline, the victim, and the chairman of the Nobel Prize committee was a Swedish biotech scientist, the author does some stereotyped descriptions of this research and labs. Too coincidently, Annika’s new neighbor a retired medical researcher is on hand to help her with questions about medical research.This book falls in between the cracks of a wooshy women’s story and a mystery and, in my opinion, the two do not create an exciting novel. For 200 pages after a wonderful opening, the story deals with the heroine ‘s family life and being a working mother. There is a new house and neighborhood to settle the family into. The children are having problems at school and her cheating husband doesn’t seem to love her anymore.Through most of the story the thriller plot is in the background, but when Marklund returns to the main plot, the book becomes a page turner. Marlund writes fast paced thrilling scenes for the assassin, known as Kitten, and finally the murderer who hired the assassin. I would have enjoyed this story much more if there had been less family dynamics and more exciting scenes with some characters drawn in more depth. Last Will, by Liza Marklund, Narrated by India Fisher, Produced by Brilliance Audio,Downloaded from audible.com.Tabloid reporter Annika Bentgzen is sent to report on the Nobel Prize ceremony in Stockholm, and the rooms in Stockholm’s City Hall where the ceremony is held. She is flirting and dancing with the reporter from her opposition newspaper when suddenly a young woman bumps into her, in fact, stepping right down on her foot with stiletto heels, and then shoots the woman in the couple right next to her. Annika is looking directly at the young woman on the floor when she dies. Annika soon finds out that this woman is the chairperson of the Nobel Nominating Committee, the one ultimately responsible for putting forward the successful nominations. The police block Annika from reporting anything to the paper she works for as she is a direct witness. In fact, Annika loses her job because she is sitting on the story of the century. Six months later, two more professors from the same research lab where the chair worked are also murdered. Annika has decided to defy the police and tell whatever she learns. She has learned that a professional killer, a woman nicknamed “the kitten” because she looks so much like an innocent suburban housewife, is responsible. She also knows that there is something else going on-something that the chair of the committee kept secret and which caused her to be killed. As she pursues her leads, she runs into trouble at home. The family has just moved into a suburban house next door to a neighbor who didn’t want anyone living there and who does everything to make it as miserable for them as possible. Annika’s husband works for the Justice Department and wants a normal sophisticated wife who will stay home with the kids so he can be the important and bread-winning member of the family-something she refuses to do. The book comes to a brilliant and exhausting climax putting Annika and her two children in terrible danger before she learns the final secrets and breaks open the case. These books are very good. I hope more of them appear in English soon. I've only just recently discovered the reading pleasure of Liza Marklund books. Marklund is a gifted writer who provides an interesting tale in a very well-written and intriguing manner. Marklund’s latest title “Last Will,” which is also my first experience with her, was a great read.“Last Will” is set in Stockholm, Sweden. Annika Bengtzon, a reporter for the Evening Post, is attending a Nobel Prize Award Ceremony banquet in the hopes of finding a story worthy of a front page headline. She definitely winds up getting more than she bargained for because this night comes complete with a once in a lifetime story as well as a gag order that won’t allow Annika to share it.A female assassin known only as “the Kitten” has been hired to kill Caroline von Behring, a member of the Nobel Prize committee at the Nobel Prize Award Ceremony banquet. Moments before the Kitten ends her target’s life a clumsy dancer knocks the Kitten off balance and she comes face-to-face with Annika. Unable to stop it from happening, the Kitten and Annika make eye contact however, with nothing out of the ordinary, apart from yellow eyes and an injured foot, Annika resumes dancing with her own partner.Moments later, hearing a muted pop; Annika looks up and sees the man currently dancing with Caroline fall to his knees. Annika hears another muffled pop and watches in stupefied silence as Caroline looks down at her fallen dance partner, then looks directly at Annika before looking down at her own chest. Annika follows Caroline’s gaze and is stunned and horrified when she realizes that Caroline is bleeding profusely. Caroline looks at Annika once more, almost as if trying to convey a message to her, before she too falls to the ground and dies seconds later.I won’t give away any more of the story but from this point Marklund takes the reader on a winding road between Annika’s life and the Kitten’s. Marklund did a fantastic job with this tale and “Last Will” transitions seamlessly from scene to scene and country to country. An “edge of your seat” experience and a “must read” for anyone who enjoys fictional suspense / crime novels. Five stars...(Reviewed in association with Rebecca's Reads). So there is this ruthless blonde American hired killer called the Kitten (really!) who assassinates the chair of the Nobel prize committee (who was obsessed with Alfred Nobel, who was obsessed with Beatrice Cenci and wrote a play about her), then goes on to kill her "wing-man" and the doctor who mends her broken leg. Oh yeah, and the next chair of the same committee is murdered too. Then there is the creationist scientist who keeps interrupting conferences and ends up murdered rather colorfully. And the charming but evil sadist who heads a multinational pharmaceutical company is messing in Nobel activities. Almost forgot, there is this hapless, maybe innocent, maybe not, Arab who is hauled off in the middle of the night and turned over to the CIA for rendition and torture in another country.Meanwhile, Annika Bengtzon is a witness to murder number one and placed on administrative leave because she can't write about what she saw. Her boring minor bureaucrat husband is working on a project to enhance government snooping so there are fights about whose turn it is to take care of the kids and whether freedom is more important than security. Her narcissistic best friend keeps asking her to drop everything and give her stuff or help her out. She is obsessed with her husband's affair from a year ago, and keeps hallucinating about killing his ex-mistress. The newspaper she works for is being reorganized again.There are a couple of interesting areas - the current state of the Swedish press and the workings of the Karolinska Institute - but they are not enough to offset the mash up of subplots and the thoroughly annoying characters. “Last Will” by Liza Marklund, published by Emily Bestler Books.Category – Mystery/ThrillerAnnika Bengtzon is a reporter for the Scandinavian newspaper, Evening Post. Annika seems to be the whipping post for just about everyone in this book. She is set upon by her two children, her husband has been in an extra-marital affair, her best friend takes advantage of her, and her boss at work is unmerciful.Annika becomes involved in several murders that take place at a dinner for Nobel Prize scholars. Annika is unable to publish her story because she got a good look at the murderer and she is prevented from doing so by the police. The description Annika gives is the very likeness of a, for hire assassin called “The Kitten”.In pursuing the story, Annika befriends the members of the Nobel Committee for Medicine. Annika discovers that there is a “dog eats dog” mentality in this community as each person must protect his studies from being used by other members of the group. Corporate espionage has nothing on these people.Several more murders, of the gruesome type, are committed and do not look like they have been committed by “The Kitten”. Annika and the police are now on the trail of two murderers and Annika is trying to balance her professional life with her personal life.A good read, especially for those who enjoy a mystery with a lot of personal life mixed in with murder. I kept wishing Annika would grow up and be as strong in her personal life as she is in her professional life. This is a continuing story so we may see Annika take charge of her personal life in the next installment. I have only read one novel by Lisa Marklund earlier: 4.5, THE BOMBER and my memory is pretty vague.So, as needs must, this novel worked pretty well for me as a stand-alone, although it was apparent there was quite a back story involving Annika's relationship with the police Inspector Q. This novel is mid way in the series.Annika was only meters away from the assassin who fired the shots at the Nobel Prizewinner's dinner and killed a scientist. Because she can therefore give them valuable information about the person who fired the shots, the police put a ban on her releasing information. She assists them in creating an identikit picture but is put on idefinite leave from her newspaper as it becomes apparent that none of her work can be published. Her leave, on full pay, coincides with an office reorganisation, and her family's move to a new house in the country leads to conflict with a very crusty neighbour.The biggest danger comes though when the assassin realises that Annika can identify her. Although Annika can't get anything published she continues to investigate the case, trying to find out why the original victim was murdered.The main story runs parallel to information about Alfred Nobel himself, and disagreements among scientists in particular about whether the prizes actually fulfil the intentions of Nobel's final will.Very readable. First time I've read this author and it was so good I've bought all her other books. They'll all be out of order but if the rest of the books are as good as this it doesn't matter. This book is Last Will and is really well translated from the Swedish Nobels testamente. The lead character is Annika Bengtzon crime reporter for the Evening Post and she is covering the Nobel Prizewinner dinner. Chaos overtakes the evening when two shots ring out on the dance floor and Annika finds herself witnessing a murder. As the police realise she caught a glimpse of the killer, Annika is frustrated to find herself detained for questioning when all she wants is to get back to the newsroom to write her report. More murders follow and Annika finds herself drawn into something much larger than first anticipated. No longer just reporting, but in danger as a vulnerable key witness. As Annika starts to close the gaps linking these crimes, the killer starts to close in on Annika. This is a very exciting book with brilliant dialogue. I found the contrast with Annika's work and private life perfectly written. As a mother of two small children and with a struggling marriage, Annika is portrayed as a dedicated and ambitious journalist, torn between trying to keep her family together and being the best at her job. So great to have found another fabulous writer. 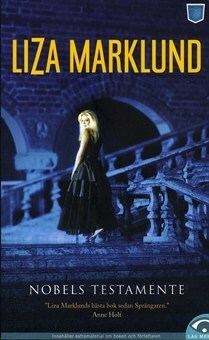 Liza Marklund - Scandinavia’s undisputed queen of crime fiction, Liza Marklund is the No. 1 international bestselling author of the Annika Bengtzon series. Liza Marklund was born in 1962 in the small village of Pålmark, close to the Arctic Circle in Sweden. She is an author, journalist, columnist, and goodwill ambassador for UNICEF. She is also co-owner of Piratförlaget, one of Sweden’s most successful publishing houses. Since her debut in 1995, Liza Marklund has written eleven novels and two nonfiction books. Liza co-wrote the international bestseller The Postcard Killers with James Patterson, making her the second Swedish author ever to reach No. 1 on the New York Times bestseller list. Her crime novels featuring the gutsy reporter Annika Bengtzon have sold more than 13 million copies in 30 languages to date.Liza Marklund worked as an investigative news reporter for ten years and as an editor in print and television news for five. Today, she also makes documentaries for television and writes for various newspapers. Her topics are often women and children’s rights. Liza has made documentaries about children with HIV/AIDS in Cambodia and Russia, and a series about domestic violence, Take a Little Beating.Liza is also a popular columnist since 20 years. Her columns have appeared in various Swedish and international newspapers and magazines, including Financial Times in the UK, Welt am Sonntag in Germany, Dagbladet Information in Denmark, and Ilta-Lehti in Finland. She is a regular columnist in Swedish tabloid Expressen and Norwegian daily Verdens Gang. Today, Liza and her family divide their time between Stockholm in Sweden and Marbella in southern Spain.